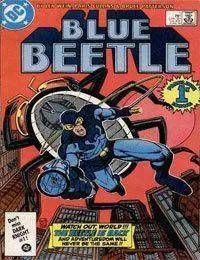 Formerly owned by Charlton Comics, the Blue Beetle swung into his own DC series with the help of writer Len Wein and artist Paris Cullins. The second man to go by this moniker, inventor and millionaire Ted Kord continued the heroic legacy of his predecessor Dan Garrett, despite not having any super powers of his own.<br />Armed with his flying beetle - shaped aircraft and a gun designed to emit bursts of blinding light, Kord set out as the new Blue Beetle. With no shortage of super - villains plaguing his hometown of Chicago, Beetles first issue detailed his clash with super-arsonist Firefist, the Incendiary Man. Other villains in this 24 issue run included Chronos and Prometheus, whilst Blue Beetle shared adventures with the New Teen Titans and Mr. Miracle.